I used to believe footwork was simply the sum of endless repetition of technical exercises. It was interesting as a way of examining the actions described in the sources, but it became clear that to improve something more was needed. Creating more and more challenging and precise technical exercises made training duller and distanced it from a dynamic context. Instead, by more free movement drills and free fencing I started seeing steady improvement. The descriptions in the sources began to feel like archetypal renditions of movement based on real-life. Not just choreography that I’d try to imitate while fencing or training freely. The Anonimo Bolognese gives the most comprehensive listing of footwork actions (passeggiate) in the Bolognese tradition. These actions are easy to perform and don’t take years of practice to execute: there are no lunges or girate, no extreme bending of the body nor is even a deep stance required. What, and how, should we then practice in our regular training if these actions are easy to do? Techniques are the first step, they elucidate the art and guide a true interpretation of the plays. They give the beginner an idea of the typical movements in the system. But after the initial learning begins a process of continuous practice and improvement. I believe the following topics are important in seeing this process as a whole. The Anonimo Bolognese describes the following footwork actions. You can skip reading this if you’re not really that interested in the specifics, as I discussed the general role of technique training above. You can always check these later if you want to have a closer look! *Change of feet*; To draw the front foot near the other and then pass the other forward..
*Lifting a foot*; To remove the front foot from its place by drawing it back, passing back or lifting suspending it in the air. *A foot chases the other forwards*; The foot that is behind draws near the front foot and pushes the other forwards. *Half pass*; Front foot steps forward half an arm’s length. *Pass on the traverse*; A long pass diagonally with the back foot. *Pass on the triangle*; As *Passare di traverso*, but half an arm’s length more backwards, deeper to the side. *Full pass*; A pass of the back foot forwards. *Reprisal of the feet*; a similar action to *L’un piede cacci l’altro avanti*, but can refer to the actual pass forward from the position where one foot is drawn near the other. Can be done to any direction. *A pass-through*; A combination of two to four full passes done long to both sides of the opponent, beginning with the delivery of a beat, a parry or a feint. When training for the competition in Brescia 2010, where I presented Marozzo’s Primo Assalto of the sword in two hands, I realized the value set choreography has in improving movement. The video is of course really cool, but that has a lot to do with a professional cinematographer, a good camera, color correction and fancy editing. These beautify a performance I now would consider mediocre at best. The interpretation isn’t flawless (before I put work on spada a due mani on hold, I made some improvements, many of them thanks to Roberto Gotti’s help). The execution of cuts is a bit lazy and some movements are only done half-way (this is what the judges critiqued the most) and I am just generally trying too much to remember the steps instead of confidently chaining together actions I know by heart. This brings me to my point: choreographic practice chains footwork actions together into efficient movement patterns and yet again combines these patterns together. Done with focus, a choreographic drill enables the steps to automatically flow together under distraction or pressure. It offers a naturally challenging way of going beyond the basic technical exercises. To remedy the problem of lazy execution I have since tried to keep the choreography to a digestible length. I would only try stringing the patterns together after I can repeatedly perform them with intensity and without mistakes in isolation. Though the practice can be lazy to begin with (it should feel relaxed and stress-free), confidence comes from success repeated. I believe the difference can already be seen between the video above and more recent videos. Though there is still much to improve, I find the direction right. Apart from the times when you need to trip your opponent or give a kick to his petenecchio, footwork in fencing keeps you in measure and position to deliver your strikes and parries with best reach and speed. It delivers thrusts and brings you back to safety. Sometimes the feet need to move you quickly out of harm’s way, other times they need to protect themselves by quick displacements. 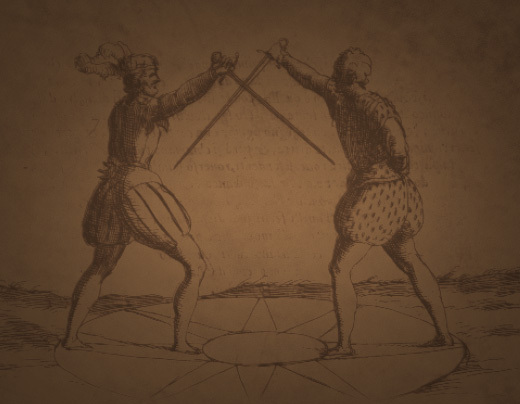 While the Bolognese steps and body movements are easy to perform in isolation, they are made better available by developing the physical attributes of the swordsman. This means being able to turn a loss of balance into an effective attack, being able to exceed the reach and speed your opponent expect and being able to perform in positions one would normally find uncomfortable. We shouldn’t fall easily if we have to quickly step back–even if we stumble. If an opening is manifest far and low, our body should not be a hindrance in taking the tempo. When extended, we need to be able to recover quickly again. We should ideally always maintain a strong, balanced and comfortable position, but reality often pushes us outside the comfortable. The training enables us to work to our advantage no matter where we find ourselves. Flexibility, strength and explosiveness enable the body to move better, but freedom of movement is a concept of being free to move within your limitations. If your flexibility does not allow you to reach further you can still accomplish your goal by being able to take the extra step needed. Freedom of movement is also freedom of expression according to the situation. Both fluid, minimalistic movement and more flamboyant passage is called for in the Bolognese style. Free form movement drills and exercises described below take you from technical exercises to efficient movement and self-expression. A full squat, ability to shift weight from side to side while in a wide squat and the ability to lunge forward in an extended position are a good benchmark for a fencers mobility. If the muscles are tense and prevent full range of motion, stretching will help muscles relax and enable further movement. Flexibility and mobility in the hips is probably the most common area in need of improvement. Careful exercise will help, but should be observed on an individual basis. The reason for mobility problems is often general lack of training and care for the muscles, or an injury. In the former case, all training and activity will usually be beneficial but the latter needs special rehabilitation planned by a specialist. Dynamic stretches such as long passing steps with few gentle dipping actions in the extreme positions are good for warm-ups. In the video on the bottom of this post you’ll see a few examples, but remember that each individual is different. Knees should never be under any twisting strain, and in the words of Scott Sonnon (quoting Alexander Retuinskih): you go towards the tension but never through it. I gladly let my pupils practice such a wide step, if in the assalti they will then narrow themselves in the natural disposition which becomes so much more comfortable. This is because they get used to toil and can hold the natural stance with greater frankness, since the body will work gladly after having withstood the harder way. And this is a good reason to be stern with the disciple, and have him practice long and hard, so that when he will find himself bouting with others, it will be easier for him to fence and he will endure with more energy. Jumps are a part of the Bolognese footwork. Often done retreating but forward as well on occasion, they are a testimony to the quick and explosive stepping the masters advocated. With jumps, plyometric training and various hopping and skipping, footwork becomes quicker and more agile. This will develop power generation and sharp changes of direction. It will help you take the temo to hit and might eventually save you when committed to a movement in the wrong direction. I wouldn’t advocate going as far as some high-level athletes, but working to be able to squat deep, lunge and quickly recover is useful. There are different ways of achieving this, but general athleticism will result in better footwork performance. Meaning: if you don’t know how to specifically train footwork, then just go exercise any way you can, and your time will not be wasted. Keeping a good position at all times and carrying it with a feeling of being connected makes you able to both exert and withstand pressure. I have found that basic strength training combined with free-movement exercises works extremely well for this as well. Specific exercises targeting posture can be done: testing your strength against various kind of pressure teaches a great deal about your weaknesses and strengths. Simply receiving pushes and pulls from a partner will help, and combining it with wrestling (of a suitable intensity) will do wonders. Wrestling, even in the form of limited games, will prepare the body for combat. It teaches the relationship of resisting and giving way which, albeit a cliché, is a fundamental skill in all martial arts. Fencing is a game of millimeters. The line between safety and being wounded can be infinitely small with live blades. Control over measure, direction and position means the ability to take advantage of these minute differences. If precision can be brought into a live way of practicing movement, I believe it will make one’s physical self-image truer and improve the intuitive understanding of these concepts. Free fencing alone with various people of different attributes can teach this well enough, but more specific exercises will enhance learning. Especially beginners will benefit from various pair-movement exercises, where basic footwork is brought to a dynamic environment. These exercises will provide repetition in basic technique while concentrating on the actual subject: using the feet for the purpose of controlling measure. This format would be suitable for bladework exercises as well, and not just movement. The below video shows some exercises I do to keep my footwork relaxed and efficient. Should you try these out please be careful and use discretion.